If you're planning to host a party this weekend in honor of the 4th, there's one thing your summer cookout must have: boozy ice cream from The Ice Cream Bar. Whether you're scooping it onto cones or into mason jars, trust me, this crowd pleaser will only make your hostess skills that much more on point. Based out of Atlanta but available at markets and package stores throughout the state, The Ice Cream Bar began perchance when someone accidentally spilled beer near an ice cream maker. The rest, as they say, is history. 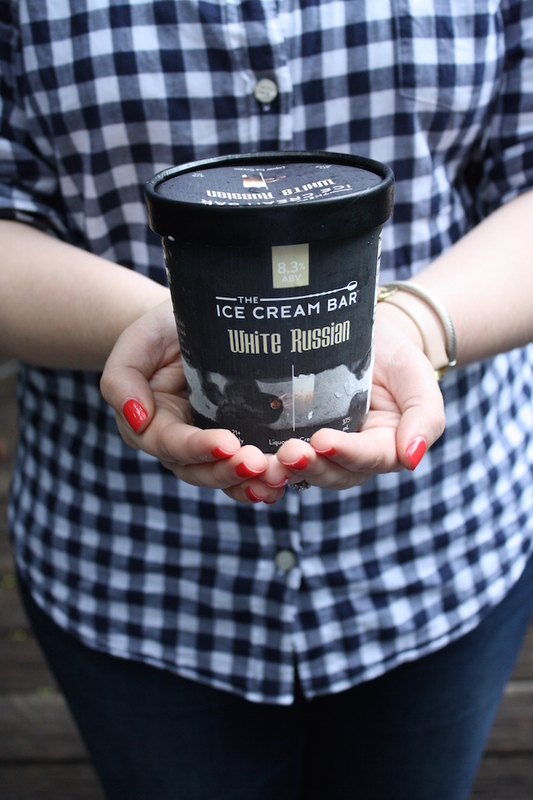 With four flavors of liquor ice cream (including my favorite, White Russian), and nine flavors of beer-inspired ice creams, there is most certainly a flavor for every guest and every party. For my gathering this weekend, I made the executive decision to pre scoop the ice cream into 1/2 pint mason jars, tied plastic spoons to the jars with metallic bakers twine, and put them back into the freezer until it was time to serve. It was a great way to quickly serve the treat without having to make a mess. Just prepare a bevy of toppings, pass out the jars, and you've got yourself an adult ice cream sundae party like no other. And if you're really thinking you'd rather be enjoying the party than slinging scoops, The Ice Cream Bar offers full service catering. I love the idea of setting up an alcoholic ice cream station at someone's birthday or company event, too! Look for The Ice Cream Bar at a market near you. These look so good! PS I love the idea of the mason jars!! So chic! !